Yesterday Parliament voted in favour of building four new nuclear-powered submarines to carry US Trident missiles, armed with modernized nuclear warheads, for the next half century, in other words to renew Trident. While this debate proceeded hundreds, maybe thousands of people came to Parliament Square with a different message. The CND rally went ahead with wise words and tumultuous applause, while on the Parliament side of the square the Christian, Buddhist and other faith groups were for much of the time the main presence. Who can have a silent vigil amid the roaring traffic and among friends that one has not seen for a year or more? Nevertheless we prayed, I know we did, and God was listening. We stood with our banners “No Faith in Trident” and placards proclaiming church statements on Trident and nuclear weapons, as a witness against the accepted narrative that was proceeding in Parliament. We attracted some attention from tourists and commuters, and we talked with some foreign and freelance media. (UK mainstream media seems only ever engaged by violence.) We talked about how we knew we would “lose the vote” – we who had no vote! Yet we know we have the power of logic and humanity. History shows that truth and goodness and common sense have a way of winning out in the long term. We know that most countries are on our side, having already decided against the false security of nuclear weapons. It is very likely that next year a ban treaty will be agreed in the UN, making nuclear weapons illegal, as has already been achieved with chemical, biological and other weapons such as antipersonnel mines and cluster bombs, that could never meet Just War criteria. If you still feel despondent about this go to http://uk.icanw.org/. Being an engineer, not a moral philosopher, I think of morality as mostly about standards, the standards by which we contrive to live together in a civilised way. But most people would agree that it also includes some basic autonomous principles, as for example, ‘You shall not kill’, which apply in principle for everyone, for all time. This principle is sometimes difficult to apply, but is nevertheless fundamental in a way that most other rules are not. And it could be said to arise, not from a prohibition, but from a more positive idea of love of, and connection with, our fellow human beings. We find that the humanitarian impulse is in our nature and so for example, human tragedies, anywhere in the world, cause us deep concern. So morality, as we know it, may be only a codification of deeper and more complex principles, but it is a vital summarisation on which we base our everyday life. And ethics is moral philosophy. There being so much written about it, over two or three thousand years, how can I presume to helpfully explain it to you, in ten minutes? Simply by introducing you to a tool, designed to help in the application of ethics in this one complex case – nuclear weapons. The application of ethics in the real world is subject to many difficulties and distortions and the sheer complexity of the problems that we try to resolve. But judging things for ourselves we look for the nub of the problem, the simple key question that we think we can answer. This is the approach applied by very many people. Good, honest, very busy people. But different people ask themselves different questions and naturally come to different answers. It is not really good enough. Here, you will be taking decisions on nuclear weapons, that relate to the stability and safety of the world, for a long time to come. It would be foolish to go forward without at least applying the moral principles that we normally live by. Are nuclear weapons so different that our usual moral principles do not apply? No. Are our judgements in this field consistent with the principles that we do apply in the rest of our life? I think they are often quite different. Have we considered the whole problem? Or are we focussed on just one or two aspects, like the man-in-the-street who, all too often, has for his ready answer: “North Korea”, or the “expert” that you can call upon, who cites our “vital strategic interest” as if it really was an answer? This is too simplistic, we owe it to ourselves and our children (and the rest of the world) to really test such a momentous decision. The tool we are proposing here, to help you tackle this critical issue, is the Nuclear Morality Flowchart. Here are all the essential questions, in the right order, in a logical network. It is simply a decision tree. You have to make the decisions. For you, for your individual conscience, it is an ethical algorithm. That is, it will enable you to arrive at the right answer for you. You simply start at Question 1 and answer the questions according to the knowledge and moral principles that you own. It may not bring you to an answer that you like. Then you may walk away muttering about vital strategic interest, or maybe you will look hard for honest ways to adjust the logic. That’s fair enough, if you’re prepared to put up for examination your alternative, and equally rigourous plan. But that’s the challenge. This issue is a challenge for everyone; we all may have to adjust our ideas. It’s about deciding whether we should engineer the means to incinerate perhaps millions of people – it’s certainly a moral issue and everyone has a moral stake in it, not only the decision makers. So we hope and pray (some of us really do) that our decision makers will come to a right judgement. That is why I commend this to you. I beg you to use this chart as an aid to an informed, rational moral decision. And in fact we require of our decision makers that their decision process is openly rational, logical, and moral. How could we achieve this? Simply by asking them to indicate their moral decision path on the ethical flowchart. http://nuclearmorality.com/ It is that easy – the software is organised for you to select your answers to the moral and practical questions on-screen and communicate the solution to your electors. Or you can use a highlighter pen on the hard copy. Let’s look briefly at how the flowchart works. Firstly we limit the scope to morality of nuclear deterrence. Then we configure all the questions to have simple yes/no answers. We distinguish between moral questions and the various practical questions which are essential to the logic. We start with the basic moral statement: “You shall not kill”, appended by a question mark. Then, whichever way you go from there, you have to examine the moral implications of practical situations. Everyone, on both sides of the argument, has quite hard questions to answer. You can see there are three routes out of the chart. What do they mean for the coming debate? These people come to a positive, practical rejection of nuclear deterrence. For various reasons they cannot accept nuclear deterrence as a long-term solution. Many of them may wish to hold off from renewal of Trident, while building a treaty to ban nuclear weapons. Probably some of them will vote to go ahead with renewal while still taking positive steps towards multilateral disarmament. These people will probably vote to go ahead with renewing Trident and take a rather hard line on disarmament. They will be happy for the UK to continue to ignore the pleas of most of the world (139 governments and numerous recent UN resolutions) asking us to collaborate with the efforts to develop a practical treaty, one which could ultimately incorporate a process, not merely an intention, for disarmament. And none of us, should forget that the world is watching us. This issue is challenging for all of us. The prospect of having to change our ideas is unsettling. For you legislators the responsibility of making the right moral judgement makes it even more challenging. And it is understandable that many in your position will fall back on ‘accepted wisdom’. But what is at stake, the consequences in this particular issue, call into urgent question the conventional mindset. We suggest this process as a means to encourage and enable you to think afresh. You have a track record here: Just over 200 years ago, this parliament, and eventually the rest of the world, voted to make the Slave Trade illegal. The arguments were often about economics and politics and even national security, but the driving force was the moral issue and that is what is remembered today – the slave trade and ultimately slavery itself, became universally unacceptable, morally abhorrent “repugnant to the principles of natural justice”. That is why we, and humanity as a whole, can never collectively go back to it. Our hope is that by making clear moral judgements this parliament will begin to do the same for nuclear weapons. In responding to the Labour Defence Review I write as a member of the Labour Party and I am a Co-Chair of Christian CND. Naturally it is Question 5 of the “Military and Security Forces” section that I wish to address. I am encouraged that you have effectively put this as a two-part question. I will deal with these in turn and add some more general comments. If you can, imagine yourself in an illustrated history book as may be read by our great-grandchildren. The page for our time will show a divided world, divided not East from West, but rich from poor. The rich will be standing with an arsenal of fantastically sophisticated weapons, enough to destroy everything. They will be facing a vast army of destitute, helpless humanity approaching in inflatable rafts, threatened every moment by the waves that wash over them. This picture could not be more macabre, but it is real. Add to it a few people whose eyes are really open, open to the whole world. These people weep for humanity and for our own foolishness. Some of them, in a position to change things, are making a real difference. Will you be one of those? Responsibility for Britain’s security must not be thought of in anything but a global context. Could you at least equalise what we spend on real human security with what we spend on offensive protection? Will you allow our military expenditure to continue to be subsidised by sale of weapons to those most unstable parts of the world where most refugees come from? As inheritors of a nuclear mindset, along with the concomitant hardware, we must listen to the increasingly clear message from the rest of the world. Towards the end of last year the First Committee of the UNGA generated a whole series of resolutions which led to overwhelming support for measures to resolve in practical ways the factors which have blocked implementation of Article VI of the NPT for 45 years. The immediate outcome is the OEWG talks in Geneva, making truly historic progress – nothing less than humanity taking the first steps towards a legal prohibition of nuclear weapons, as has already been done for other classes of WMD. Britain should be there, in these multilateral negotiations. Ultimately they will lead to development of a treaty which will include a practical process of multilateral disarmament, not merely a vague commitment as we have now. And if you need a ‘Britain first’ policy prop, think ahead to potentially profitable roles in such a treaty. It will require an international agency (e.g. as in Article 8 of the draft Nuclear Weapons Convention, 2007). Britain has the technical, diplomatic and political know-how to host such an agency. Again, the answer is No – most profoundly No. We would like to assume that the values that guide our foreign and defence policy are the same as those which guide our lives, both personally and nationally. We know that this is not always true but we do accept that in general the British people at least like to think so and this is a motivation towards a more humane and generous policy; one that is not obsessed with British security at the expense of the world. The utility of nuclear weapons depends on their potential for vast indiscriminate destruction. This is clearly contrary to the Christian and other traditions of Just War. Hostage taking is unreservedly condemned in our conventional value system but we use nuclear weapons to make hostages of whole populations. Nuclear weapons are weapons of terror and blackmail. The military means that we contrive to maintain this covert and supposedly invulnerable threat allow us to think of them as weapons of war, but in principle this is not different from the covert way in which terrorists deliver their weapons. No-one doubts that nuclear weapons are deployed for reasons of prestige and strategic power politics. There can be no moral justification for this; indeed it is a manifestation of moral weakness, bullying and intimidation. A denial of our values. The circumstances where nuclear deterrence might be effective are clearly limited. However Britain’s nuclear weapons are routinely referred to as the “deterrent”. It sounds like a good a thing, but in view of all the above this is a misleading euphemism. Values are important. In accepting nuclear weapons for our defence we live with an inconsistency in our lives, a denial of some of our moral values. To cope with this we suppress or segregate the conflicting values but this is not good for the wellbeing and integrity of our nation. Never doubt that nuclear weapons can be abolished. The making of nuclear weapons requires a vast amount of engineering. We employ thousands of professional people just to maintain the technology; it cannot be done in secret and we can decide not to do it. A treaty to ban nuclear weapons is therefore a very practical possibility. Economically, technically and militarily Trident is a vulnerable project and may be increasingly embarrassing for whoever is responsible. They will be looking for a way out. Stepping across to some moral high ground from which to scrap it might well be an irresistible temptation. The Tories could do this with no electoral cost and they love being radical. In fact everyone would love them for it. On the other hand Labour could have the vision and the courage to take a lead. I wish you every success in this major project. This will be an open meeting to debate the merits of unilateral and multilateral disarmament in achieving a nuclear free world. It will also be an opportunity to debate the ethics of nuclear weapons, regardless of your position on the issue. The Heston Justice & Peace Group, Pax Christi, Christian Campaign for Nuclear Disarmament have been holding such briefings and discussions with Parliamentarians from across all parties. They have created a Nuclear Morality Flowchart, which is simply a decision tree, a logical network of moral and practical questions designed to encourage and enable a full and rational response to this complex issue. You can try it now at http://nuclearmorality.com/interactive/interactive.html . Ask your MP to try it and then send you his or her decision path. The special software makes this easy. Politics and government is really all about deciding things. When we elect people to Parliament we are electing them to decide things for us, or in practice electing a government to decide things for us. We should be thankful that at least some of the issues come before Parliament, to be subject to debate and a vote by our elected representatives. What we need to know as electors is how will they vote on crucial issues like renewing Trident. At the very least, and in so far as they can decide for themselves, how would they like to vote? Will they have a free vote on what for many is a moral issue, a matter of conscience, or will they be constrained by party whip or loyalties? Knowing this would inform us as electors in a genuinely democratic system. Tabulated below is the list of candidates for the constituency of Feltham and Heston in the 2015 General Election. As they respond to our request, a link will be added to each name, which will bring up their own personal solution to this moral problem. One of our greatest responsibilities in a democracy is to elect our Members of Parliament. Often we think that our responsibility ends there and we leave the policy decisions to those we elect and the experts, frequently encouraged by our political leaders. Robert Dahl, in his essay “Democracy versus Guardianship” says “We have, in fact, turned over to a small group of people decisions of incalculable importance to ourselves and mankind” So we have given this special class of people sole responsibility for the decision whether or not to kill millions of people and destroy vast areas of the planet by firing nuclear weapons- without any participation by the people who paid for those weapons with their taxes or by those who voted for the leaders who gave the final orders-Where is democracy here? Once citizens no longer feel qualified to participate in discussions about their very survival, the connection between the governing and the governed is severed. Is this democracy? The nuclear-armed submarine, this obscenely powerful engine of destruction and death, when deep under the ocean at a time of political tension, is difficult to communicate with. The Extra Low Frequency radio waves that can penetrate such depths take many minutes to arrive, so at the most critical moment it is almost,.. incommunicado. “The two artifacts, the social contract and the nuclear array are mutually exclusive. To exist, each requires that the other be destroyed. Which one will it be?” Elaine Scarry. Information and quotes from `Bulletin of the Atomic Scientists’ (columnist; Kennette Benedict) and “Harvard Magazine’ (columnist: Craig Lambert). Are we really awake, or are we in a mad dream? It seems like that, when we see the daily need to make a case for something that is blindingly obvious. Nearly everyone agrees that nuclear weapons are terribly dangerous, that they could destroy all of Earthly creation and that this could happen, by accident, madness or evil design. But still the political establishment and a significant minority of the population think we must continue to deploy nuclear weapons, at enormous cost, for the next forty years. We are surely trapped in a nightmare. And yet we know we are awake; we know we have to persevere, patiently explaining the case against retention of nuclear weapons. It is easy to show the cost – an economic case is nearly always the best approach for short-term gains with the electorate. We all crave security. For that we commit billions of dollars, compromise our reputation with the rest of humanity and argue with the highest legal judgement on the planet. But for those who want to believe that nuclear weapons make us more secure there is more evidence every day that they have to ignore. However, the humanitarian case has proved to be the way to wake up the world to the danger and to the injustice – the injustice of exceptionalism that allows a few rich nations to put at risk the rest of humanity for their own misjudged view of security. Thanks to three major international conferences on the humanitarian impact of nuclear weapons the idea of asserting the right to possess them is becoming stigmatised in the eyes of the world, and no doubt in the eye of history. Nuclear weapon states choosing to ignore this process, come to the table at the ongoing NPT conferences with no moral clothes to wear. And having reached this stage of global awareness, the next phase (short of a new draft abolition treaty) is for the nuclear weapons states to be held to account morally for the destructive power that they persist in retaining. Morals can be seen as standards by which we are enabled to live together, but most people can also see that there are intrinsic autonomous values which should rule our individual lives. Therefore the moral case has power both at national and individual level, because to be defended by nuclear weapons is to accept a situation which is totally inconsistent with nearly every other aspect of our lives. People can live with this inconsistency only until they see it clearly. Governments can live with it only until their people can see it, and have the courage to hold them to account for it. So, beyond the humanitarian case there is the moral case. When we can make it clear that nuclear deterrence (which is at the heart of all the so-called justifications for nuclear weapons) cannot function without a commitment to mass murder and human suffering on a scale never before imagined, then humanity has to reject it. And this in fact is the key to abolition. Abolition is forever. How can that be achieved? How can we be sure that nuclear weapons are rejected for all time? We will achieve this permanence only when there is a profound and widespread moral dimension to the decision. There is a close parallel with the abolition of slavery. We still struggle to prevent slavery but collectively, as a global society, we can never go back to it, because after centuries of acceptance for economic reasons, we finally came to see that it was morally repugnant and incompatible with universally accepted values. When that is achieved for nuclear weapons we have a good chance to banish them forever. To maintain the technology and the vast amount of engineering needed for creating even one nuclear weapon is not easy. Even Britain, one of the smallest nuclear powers, has more than 5000 highly qualified people engaged in the task. In the face of a universal moral awareness and global censure, such a high level of activity could never be hidden or sustained. It will be abolished. There is hope for our world. It is my priviledge to publish this letter here. About ten years ago Mrs Deep Sandhu sent it to the leaders of every country in the world. She gave me a copy during my talk for Ealing U3A on Ethics of Nuclear Deterrence. That was a serious discussion on how to resolve the difficult moral questions, but here, heart speaks to hearts, and in the end they must listen. God help us if they can’t. I am not a politician —just an ordinary seventy years old woman. When I was 22 years old I suffered from Tuberculosis. I still remember how awful it was watching people dying around me and thinking I might be next. It felt so great to be alive when I left the hospital. I decided to make good health my top priority in life. One can face or cope with anything as long as one is healthy. I have always tried my best to tell my friends and family how important our health is. I am not Mother Teresa, but I would do ANYTHING to turn our world around from its present destructive course. The first step is to plant a seed in your brain, which hopefully will grow to ring alarm bells in time to save the world before it is too late. You have children of your own, and one day, God willing, you may have grandchild as I have. It scares me to death what sort of world we are going to leave for them. The way things are going we can easily start World War three. It would not be like the last 2 World Wars, It will be the end of our planet, as we know it. Surely just thinking of that makes you feel that you want to be rid of all those nuclear weapons on the planet. We are all one God’s children — drops of the same ocean. Surely we don’t want to poison the sea, as it will affect all of us? There will be no escape from it. Instead, why don’t we learn to take care of each other? We need to create balance in the world. In this day and age every human being should have the dignity to have at least their basic needs met – of food and shelter. I am sure we can change things around and really start caring for each other. Instead of spending millions and trillions on war, we could feed humanity. I have a very dear old friend who is a writer. In 1991 he wrote a book about Hiroshima. This book is about the endless suffering and pain of innocent people caused by Americans when they dropped the Atomic Bomb on Hiroshima, and three days later another in Nagasaki when more than million people were killed. As a result, for decades there were a great many disabled and malformed, badly distorted faces and bodies. As you read the book you hear the cries of the wounded, see thousands of scattered parts of the blown up bodies, and smell the stench of huge piles of rotting dead bodies. These scenes keep playing over and over again in your mind, as if you are watching a video. After intensive research and talking to people who lived through those horrific experiences, the writer explains exactly the enormity of the pain and damage caused by those acts of madness. Years later, thousands of people are still suffering from leukemia, blindness, cancer and other dreadful diseases because of the poisonous gases. Any thinking person must realize the danger of any nuclear weapons on this planet. There have been mistakes made, either through human beings or technology, that could have resulted in World War three — e.g. the Cuban Missile Crisis, not forgetting Chernobyl. After reading my letter, I would like you to sit down in a calm place, close your eyes, take a few deep breaths and focus on the future of your grandchildren. What would they inherit from us, a planet full of poisonous gases? We plant seeds that one day will grow. It seems that governments are addicted to power, almost by definition. Thus when the whole world longs to be free from the threat of annihilation that is implicit in the continued existence of weapons of nuclear mass destruction, the nuclear nations cling to their bad-boy status. In defiance of the spirit of the Non-Proliferation Treaty, Britain and France have agreed to collaborate on nuclear weapons technology, by sharing research facilities for the next 50 years! How ironically appropriate that they have named this irresponsible retrograde treaty after a Celtic war god. Teutates (Tutatis of the Asterix comics) is not funny any more. However, collaboration at dinosaur government level is being matched by international cooperation among peace campaigners. I was privileged to be one of eleven campaigners on the Christian CND journey to Valduc and Paris, linking with local and international activists to protest the Teutates Treaty. Valduc is the French nuclear weapons facility, hidden away in forests about twenty miles from Dijon. It is more remote than Aldermaston but of similar size and we think around 1000 people work there. Just as at Aldermaston or Burghfield, the workers are all inside while the protesters bring their message to a highly defended but otherwise deserted gateway. Police presence was quite intensive – it was only thanks to patient negotiation by local activists that we were allowed to walk past and no photography was allowed. However, also thanks to our friends at Dijon, we had a TV journalist walking ahead of us. Her film and subsequent interview got us three minutes on television http://bourgogne.france3.fr/node/297751. The odd thing about this coverage is that the rather oppressive police presence, in cars and motorbikes etc, is not visible. We were supposed to walk past without stopping but at the gate they let us stop for one prayer. Then we all got back in our van and went to a local village, an agreed place to do the TV interview. One police car followed us around for hours. 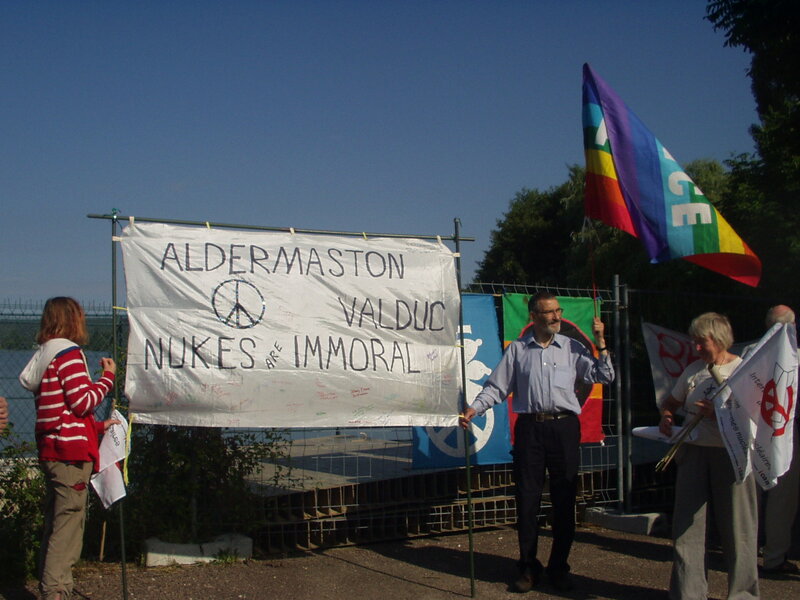 The first thing you see in this footage is our “Aldermaston to Valduc – Nukes are Immoral” banner. This was made by a member of Wimbledon CND. I first saw it on our recent (KPC) trip to Burghfield – we were encouraged to sign it for solidarity with French activists for the visit to Valduc. It got signed by more people at the National Justice and Peace Network Conference and all these messages were taken right to the gates of Valduc. And it gets better: on 6th August – Hiroshima Day – we were able to introduce the idea of the banner in our report to all those participating in the international “Non aux armes nucleares!” vigil and fast at the Mur de la Paix in Paris. Many more people spontaneously signed it. Now it is a truly international symbol of solidarity for peace. We carried the banner amongst many others in the subsequent demonstration walk and ‘die-in’ at the Eiffel tower and then we took it to the UK Embassy, where, however, an intensive police presence prevented any demonstration or contact with the embassy. I think the banner is back in Wimbledon by now. Well done to whoever had this idea. Another idea is in hand: in response to the manifestly bad government-level Teutates treaty we shall have an equivalent document: a treaty for cooperation between peace activists of Britain and France. The “Eirene Treaty” is in preparation. Eirene was a Greek goddess, their personification of Peace. It seems like an endless cycle. How long will it be till people can see that violence is not the answer to violence? 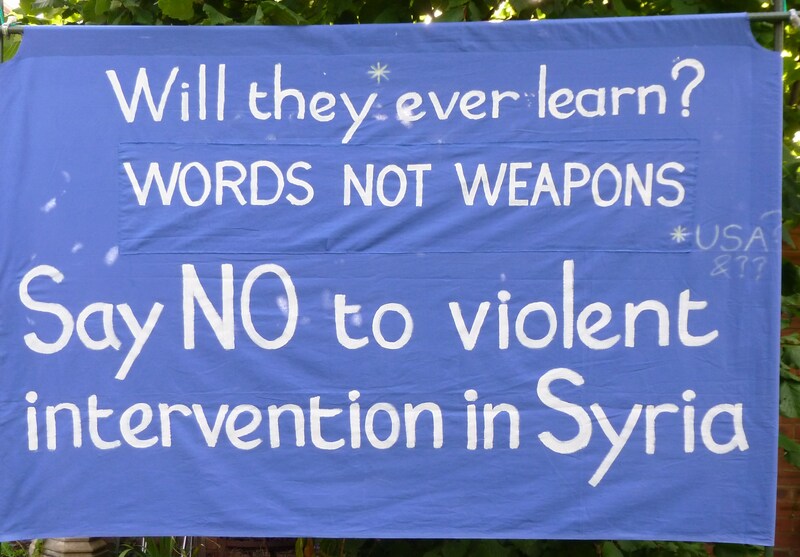 Even a limited violence, imposed on Syria by Western nations is likely to have negative effects throughout the region. It would be a natural response from our militaristic culture, but could prolong the evils for which, historically, we bear some responsibility. The situation in Syria is now so terrible that an intervention by a United Nations force might be justified. However, for reasons of credibility and natural justice it would be imperative to exclude from such a force the British and American forces that are, and are seen to be, responsible for so much of the historical chaos of the Middle East. The extreme irony that this emergency is taking place at the very time of the DSEi arms fair in London, where up to 28,000 will gather to participate in the evil trade that largely relies on, and indeed ferments, insecurity in the Middle East, will, we hope, be noticed. 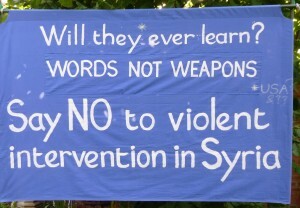 Yesterday in London thousands of people demonstrated against any new act of war in Syria. There are some times when, fortunately, MPs and Representatives can make a difference. Please, US Congress, make it now.